What’s better than a vacation on a tropical island, walking barefoot down a soft sandy beach, listening to the soft lapping of waves and seagulls, or spying breaching dolphins and curious seals in the surf? Ditching the beach crowds for your own private wilderness, and forgoing the ritzy resort hotel with its fuzzy bathrobes and redundant oceanside pools for a tent and a bed on the world’s best natural mattress—the sand. Camping on the beach doesn’t work like camping in the woods. Rather than a hole carved out among the trees, an entire swath of land appears, at least at first glance, to be ready for pitching a tent. And even in areas that are well known or designated as beach camping destinations, there are often no specifically marked spots for individual tents. Then just camp anywhere? Not quite. 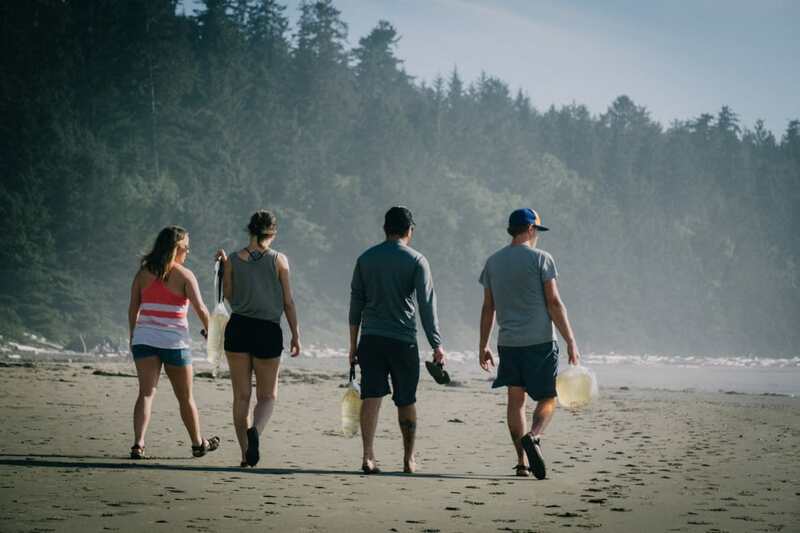 Just like when you’re pitching your tent in the forest and you look up to find dangerous tree branches or other debris, you’ll want to keep a few things in mind on the beach, as well. 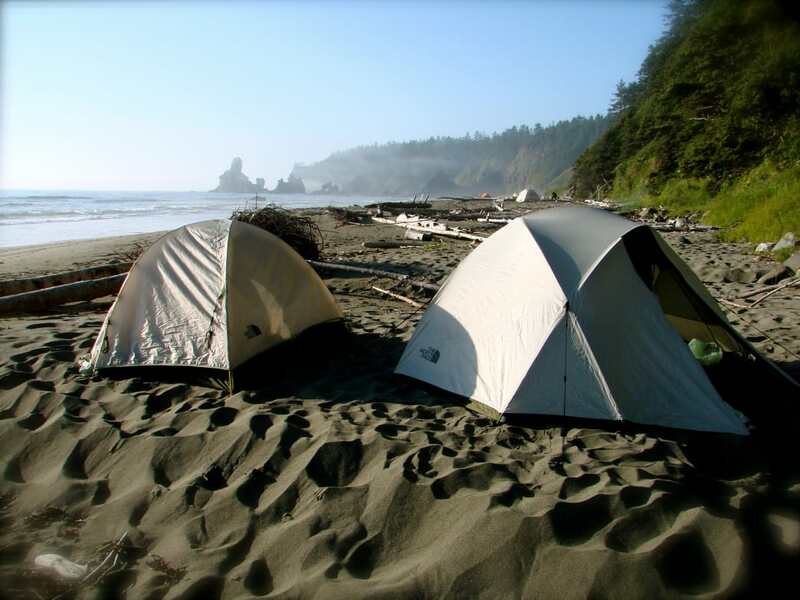 Get intimately familiar with the tides in the specific area where you’ll be camping. They’re different depending on where you go, so use an app like “Tide Charts Near Me” to pinpoint your exact location. Know when high and low tides are, and how high they’ll be. It can be tempting to camp close to the water, or even at what you think is a safe distance. Depending on your location, the size of the beach, and the time of the year, the water can move a long way between high and low tides. Look out for things like debris and seaweed to get an idea of how high the water will come at high tide and camp well away from that point. Also be cognisant of any peninsulas or sand bars to make sure that, even if you’re above the waterline, you don’t end up unexpectedly marooned on an island. Water, water everywhere? Just make sure there’s a little bit for you to drink, too. It’s not unlikely that, as much water as you’ll have nearby, you’ll be hard pressed to find anything potable. Know ahead of time where you might be able to find streams or other bodies of fresh water (keep in mind, they could be dry or weak at certain times), or be prepared to carry it all in—enough for drinking, cooking, and staying clean. Sand has a natural ability to infiltrate everything—our clothes, boots, tent, sleeping bag, and more. Keeping it in check can go a long way toward maintaining your sanity and enjoying your trip. Before you head out, make sure everything that you want to stay sand-free is sealed up. Plastic zip-top bags are an easy way to make sure the sand stays out of places you don’t want it, like in food, electronics, or clothes. 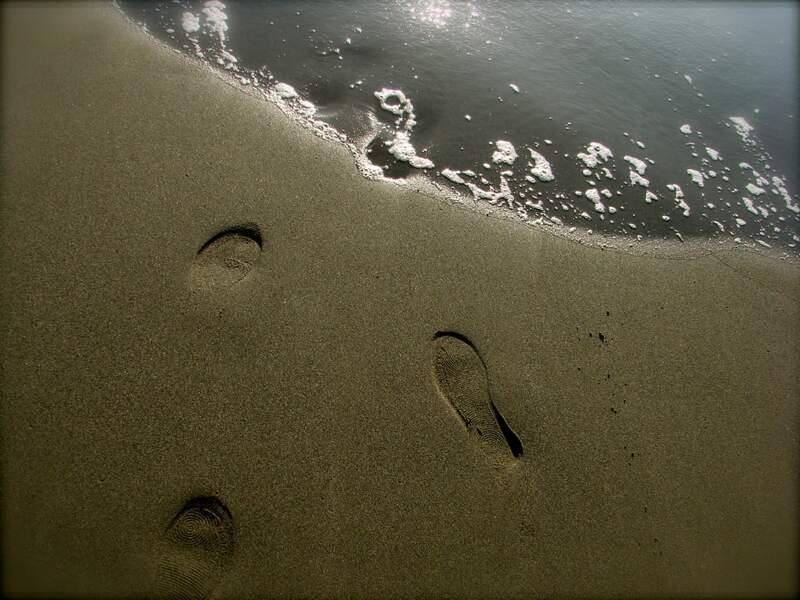 Take your shoes off and brush the sand off your feet, pants, and hands before going near your tent to get inside. Bring a towel that you can designate as the sandy towel to wipe things off, like your feet before you crawl into your sleeping bag. Elevate your cooking materials off the sand as much as possible and be extra careful when walking around them that you don’t inadvertently kick anything into your cooking food. 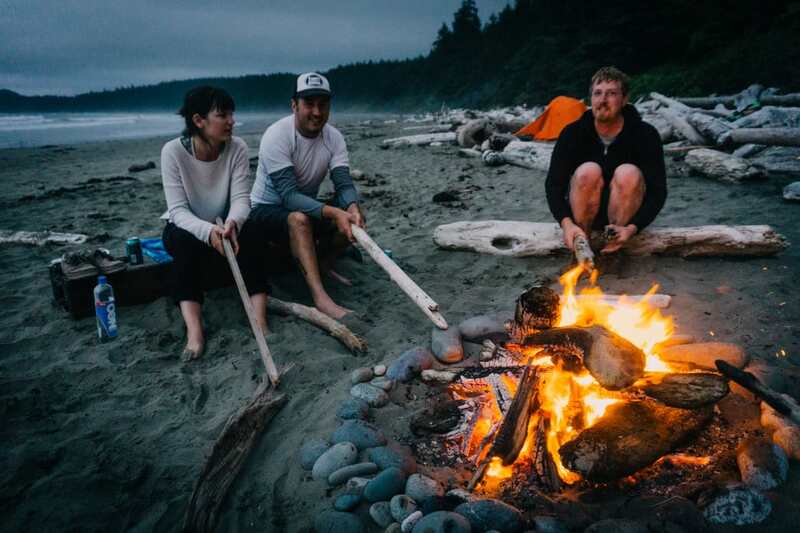 Beach camping isn’t something you necessarily need hot weather for, but it certainly helps. Don’t neglect to bring the things you might normally bring to the beach: Sunscreen, sunglasses, light layers, and so on. However, even for trips where you’ll be spending your days in a bathing suit, be prepared for cold once the sun goes down. A windy, wet climate can mean chilly nights, so pack a jacket, warm hat, and warm sleeping bag (with the constant threat of moisture, a synthetic bag or one with hydrophobic down isn’t a bad idea). Definitely do a little research before heading out to spend a night on your local beach. Setting up a tent is illegal in a lot of places, but there are a few sandy highlights worthy of anyone’s backpacking life list. A satellite chunk of Olympic National Park abuts the Pacific on the western shore of the state—and it might be one of the park’s best parts. Shi Shi (pronounced ‘shy-shy’) is far from a secret—you’ll have plenty of company, as it's popular with day hikers—but its ease of access, incredibly picturesque beach camping, and readily available fresh water make it an ideal first-timers getaway. This is about as tropical as it gets. The 11-mile Kalalau Trail links Ke’e Beach and Kalalau Beach along the Na Pali Coast and takes you along steep sea cliffs, flanked by waterfalls and rainforest, and down to pristine sandy beaches. The best part? The sunset from your campsite on the shore will rival anything you’ve seen. Keep an eye out for wild horses along these barrier island beaches and spend all day in the water or lounging on the long shoreline. Just be careful: there’s very little shade to be found on Assateague, so come prepared with shelter and sunscreen! Written by Ryan Wichelns for RootsRated.